You’ve learned how to create an ebook and have just wrapped up an awesome, comprehensive, kickass piece of work. You spent hours coming up with the topic, deciding what ideas to cover, and actually creating your content. Now that it’s complete, it’s time to sit back and watch the leads roll in. Unfortunately now is when the hard work begins. 64% of B2B marketers used ebooks as a lead generation strategy in 2013. That means your ebook is competing with thousands and thousands of others. You need the right people to see your ebook at the right moment to score you valuable new leads for your business. It’s like if you spent time and money organizing a big New Years bash, and then forgot to tell all of your friends about it. Lucky for you we have the perfect combination of promotional strategies that you need to use. 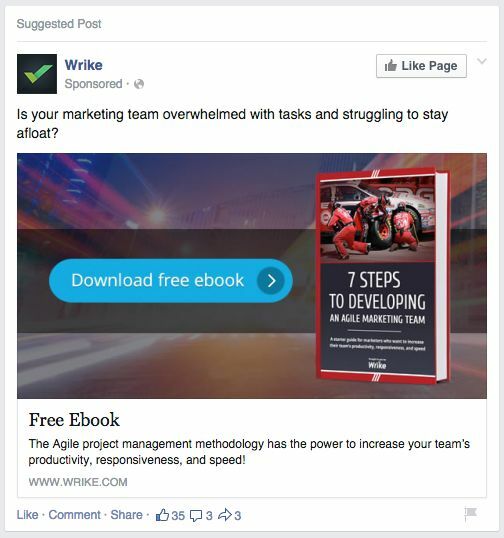 Facebook is the perfect place to target your ebook to a specific audience. Facebook Ads allow you to create sidebar or News Feed ads targeted at your exact demographic. You get to decide the number of people who will be exposed to your Ad and the budget you’re prepared to spend based on your lead value. Your Facebook Ad has to compete for users’ attention against their best friend’s baby and sister’s adorable new puppy. In order to stand out you need an image that will stop them in their tracks and grab their attention. If your ebook has an appealing and bright cover, it may be the perfect image to use. If it’s not, choose an image that represents the topic of your ebook. Always avoid using blue and white in your image, as it will blend in with the general Facebook background. The image in the Facebook Ad below is a perfect example. They have included the cover of their ebook which is eye-catching in red, as well as a dark background to make the ad stand out on the white Facebook background. While your image catches the eye of the user, your headline and body copy is what increases your click-through rates. Your headline should be specific to your ebook and make users want to learn more. Questions that hit at a pain point are also effective. For example in the ad above they have used “Is your marketing team overwhelmed with tasks and struggling to stay afloat?” This taps into the underlying concerns of the targeted audience and prompts them to read further. With only a few lines of text available in the body and News Feed Link Description, you need to word your ad in a way that makes people want to click. In the case above they’ve given the benefit of how their methods will increase your team’s productivity, responsiveness, and speed. They have also included a bright blue CTA on the image making it obvious what action users need to take next. Learn the science of optimizing your Facebook Advertising campaign in this article by my colleague James. The largest benefit to using Facebook Ads to promote your ebook is that you can select a very specific target audience. This means you can use your budget wisely, showing your ad only to those who would be interested. First, ensure your ebook is targeted only at English speakers. Consider selecting countries with large English populations such as the United States, the United Kingdom, Canada, Australia, and South Africa. In terms of age, ebooks are one product for which there really is no targeted age group. That said, you may want to eliminate 18 and below as high-schoolers are unlikely to convert. If your ebook is B2B focused, targeting by gender is also not necessary (although it may be for some B2C subjects). Next you need to narrow your target audience down by demographics. You can target based on certain information like relationship status, job, or any recent life events. While not needed for B2B ebooks, a B2C ebook on parenting or being an expectant parent could hugely benefit from this form of targeting as you can select these options from the list. Another crucial targeting stage for the promotion of your ebook is behavior and interest targeting. Under behaviour targeting you can segment based on the type of mobile device the audience is using, their travel, if they’re small business owners or if they are the admins of any Facebook Pages. This information can be very influential when trying to find the appropriate audience for your ad. Lastly use interest targeting to define your audience by their listed interests and activities. You would be surprised at the number of people who write down social media, A/B testing or SEO in their interests, making segmenting that much easier. For example if you wrote a small business owner’s guide to CRM you can select small business owners under behaviour, and customer relationship management under interests and see the following audience of 134,000 individuals. Facebook will provide you with your ad’s Estimated Reach - an idea of the number of Facebook users who will see your targeted ad. Keep an eye on this number to determine if you’ve gone too specific or if you could narrow your reach further. I recommend an ad reach between 100,000 and 500,000. For your ebook you can also choose to target your existing list from your CRM system or can create a lookalike audience. Learn more about creating a targeted Facebook audiencehere! Google Adwords can reach over 2.6 billion searchers every month with a potential reach of 90% of all internet users. While Facebook is great for expanding awareness, Google is a perfect tool for immediate conversions. It can get your ebook seen months before a potential lead stumbles across it through SEO. With Google you can specifically target who you want to be exposed to your ebook. You can again choose to target based on country, city, age, gender and parental status. You will also want to narrow your search by language, for example to only English speakers. 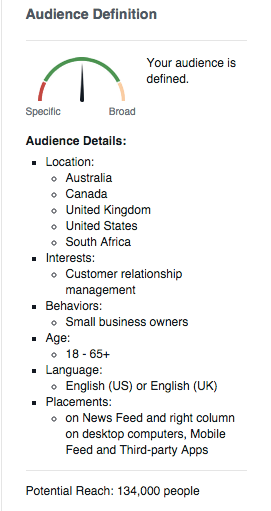 By excluding multiple countries, languages or age groups your costs will be reduced as you narrow your audience. Adwords also allows you to attach your ad to relevant keywords, crucial for targeting based on your ebook topic. It gives you the flexibility to hyper-target those audience members you’re very interested in. You can bid on the keywords you want to trigger your sponsored ads to appear in the search engine results page (SERP). Google decides which ads are displayed and in what position based on each user’s maximum bid and quality Score. A quality score is determined by the ad copy’s relevance and its landing page’s relevance, its click-through-rate and other performance measures. A higher quality score means more impressions at lower costs for you. Adwords can come at a higher cost to your business than Facebook Ads, so it may be hard to see a short-term positive ROI. You would only want to use Google Adwords to promote an ebook if the product you are selling comes at a high price. This means it’s harder to generate leads off the bat, so nurturing with free content through a Google Ad may be an easier way to capture information off potential customers, with the hopes they’re willing to pay the price in the future. Businesses like Marketo and Salesforce, which come with very hefty monthly fees for a small to medium sized business often promote their ebooks through Google Ads. An example of this can be seen below when searching for information on CRM systems. At Wishpond we don’t use Google Adwords to promote our ebook content as our services come at lower prices, so there is a smaller barrier to potential customers. But Google Ads may be the promotional tool your business needs to get a maximized conversion rate on their ebook. Website popups can be used to promote all types of content on your website and blog, including ebooks. You can use exit popups to capture potential leads on their way out the door, entry popups to grab them on their arrival or a scroll or timed popup as they browse and read down the page. 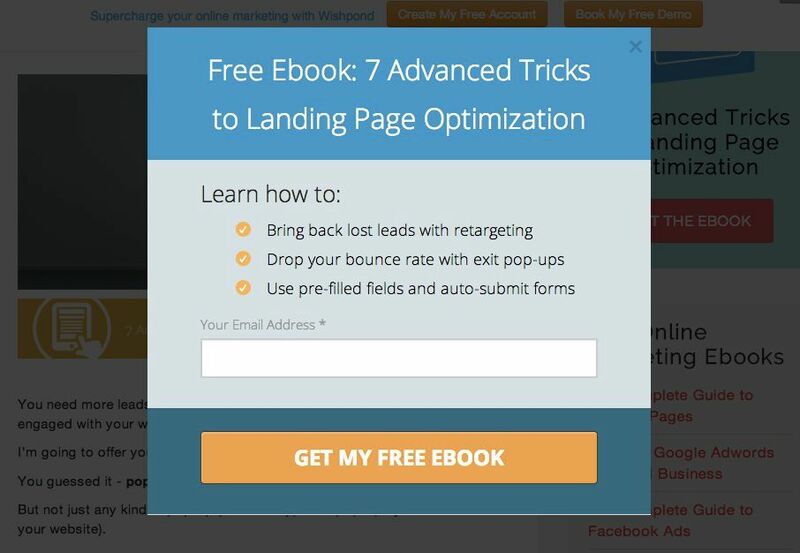 Each of these popups is a great promotion technique, but our favourite popup for ebooks is the click popup. A click popup is activated when a visitor clicks on a designated link, image or word. Place click popups at the top or bottom of your blog articles, on your blog’s sidebar, and on different pages of your website. We promote our ebooks with various click popups on the pages of our blog as seen below. We have placed this ebook popup using CTA banners on all of our popup articles, as a further piece of content for readers. But why is a click popup better than a separate lead generation page? Using a click popup allows your visitors to convert without having to open and load another page. It serves the same purpose as a lead generation page but doesn’t make visitors wait. By speeding up the process, there’s a smaller chance of possible leads bouncing. The popup loads in the background when a person lands on the page so when they click the CTA, it appears instantly. Our own A/B tests consistently show we have a higher conversion rate on an ebook popup than we do on our ebook landing pages, so they’re definitely worth trying out. Place a banner at the top or bottom of blog articles and on the sidebar of your blog or web homepage. When designing your banner be sure that it is eye-catching with the content title clear and obvious. Include a short blurb to convey the value of the ebook and the benefit to your visitor from downloading and reading it. It also helps to include a small image or graphic to grab the attention of users and make sure your banner is seen. Lastly you need to connect the click popup code to the banner image, so that it appears when visitors click the banner image. The CTA banner is placed on a related article about generating leads by using popups. Visitors looking for ways to generate new leads for their business are more inclined to convert as landing page optimization is crucial to generating leads. The title of the ebook stands out obviously on the popup, showing leads they’ve arrived at the popup relevant to the banner they clicked. The benefits list clearly displays what leads will gain by downloading the ebook. By showing the ebook’s value in a list it’s easy for readers to quickly scan and decide to convert. The call-to-action button stands out in bright orange and is impossible to miss when a visitor first arrives at the popup. 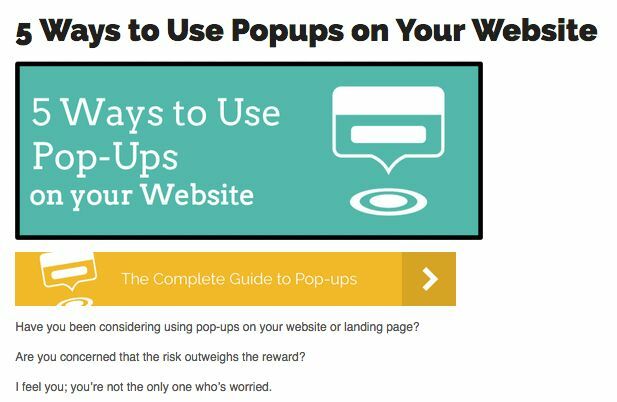 To learn all of click popup best practices check out our article Your Blog Popups are Probably Annoying as #&^%! See Why Ours Aren’t. Writing content and contributing to other blogs is another great, though under-utilized, way to promote your ebook. Many people don’t realize the power of spreading your name around the internet as a guest poster. Reach out to other blogs or websites whose audience matches your target market. At Wishpond we often have guest posters contribute to our blog, and also get involved with many high-profile blog sites, such as ContentMarketingInstitute, Kissmetrics, ProBlogger, TheSocialMediaHatand more. In the conclusion of a landing page best practices article the author has included linked text to the ebook download page. Those who have read this article are definitely interested in the topic of the ebook and are the perfect audience to target with promotion. Another great opportunity is to include your ebook in your author bio. This can be on your own blog or web pages as well as the bio you send with guest contributions. Including “ author of the ebook: _______” allows every individual reader who gets to the end of his articles to have access to his ebook download page through a single click. It also adds credence and authority to his reputation. If you’re looking to spread awareness about your ebook and make sure it’s seen, always consider guest contributions. It’s often overlooked as a way to get your name out there and your content seen. Retargeting allows you to show specific ads to people who’ve already visited your website, but failed to convert. This means they didn’t complete their purchase or fill out their personal info to make them a lead. Even though you don’t have their information, you can add a tracking pixel to your website and track these abandoning visitors with ads across the internet. You can show specific, targeted ads to these visitors on almost any website that features banner ads. You can segment them based on the product pages or articles they viewed, and show only ads directed at that product or topic. Retargeting provides you with the perfect opportunity to promote your ebook. One valuable benefit of retargeting is that you can track those who were and still are very interested in your products or services. You know they’re interested so you’re targeting an audience who already has knowledge and is warmed to your business. One example of this for a SaaS company would be to promote your landing page ebook to someone who has come to your site and viewed the various pages on your landing page tool and templates. By viewing these pages of your website they have signaled interest. But they may be shopping around with different providers In the days following that same visitor may see ads for your landing page ebook while online shopping, reading the news, or looking up the score of the big game. Your retargeting ads offer further value and expose the prospective customer to your brand over competitors. And no, B2C businesses I haven’t forgotten about you. Let’s say you own a health foods store selling both on and offline. A visitor comes to your website and views the various products in the “Vegan” tab of your store. In the days following you can target them across the web with ads for your online vegan recipe book. In this case retargeting has provided you with the proper target audience, and allowed you to show them your valuable ebook at the right time. Content marketers often don’t realize the value of retargeting ads for promoting content and increasing your conversion rate. No matter what your business is, using retargeting ads is a great way to generate ebook downloads and cling on to those leads who could have been lost forever. If you don’t know the positive effect social media can have on your content, you’ve been living under a boulder for many years. Promoting your ebook via social media doesn’t mean just sending out the link to the download page, it’s far more than that. Social media provides you with multiple different opportunities to let people know what you’ve created and how it will benefit them and their own personal networks. It’s the best way to reach the masses and, best of all, it’s still free. Firstly, social media is great for direct outreach. This involves contacting influencers in your field and asking them to take a look at your ebook and see the value included. You can then politely ask them to share it with their friends if they saw it as beneficial. While it seems like a lot of work, it can result in those individuals tweeting or sharing with their thousands of followers, meaning new exposure for your ebook. Post a link in your Twitter or Linkedin bio to your ebook download page. This lets any new or existing followers or connections see the great content you’ve created up front without having to search. Another method is to start a discussion on LinkedIn or Google+, then linking to your ebook. These platforms allow you to connect with others in the field who you know are interested in the topic. Use Twitter to send out Tweets that include questions your ebook answers. For example a landing page ebook’s author may tweet “Which elements of your landing page are having the strongest effect on your sputtering conversion rate?” followed by the link to their ebook download. This hits at a pain point and leaves your followers wanting, or needing to know, the solution. You can also tweet out quotes from your ebook. Every tweet you create should provide value to your followers by making them think or providing them with beneficial information. Giving a short insightful quote, followed by the link of your ebook and a specific hashtag is a great way to engage followers and create interest. An example of this from the same landing page optimization ebook may be “While many believe aesthetics aren’t important, a poorly designed landing page is proven to kill businesses’ conversion rates.” followed by a link and the hashtag for your ebook. If you’re a business and already have a social media presence it’s not hard to get the word out about your new ebook. But you need to use a variety of techniques to tweet, share and discuss your ebook and boost your conversion rate to success. When you complete your ebook and publish it for the world to see don’t think that your work is over. Utilize these different strategies to ensure you get a strong conversion rate and a positive ROI on the time and effort you exerted in the process. It’s time that you realize the potential of your ebook and the wide audience you can reach and gain as leads with a diverse handful of promotional strategies.